the characteristics of consumers who are likely to increase consumption in net terms. Both the Mizuho Research Institute (2014) and the Tokyo Metropolitan Government’s Bureau of Olympic and Paralympic Games Tokyo 2020 Preparation (2017) estimate that the macroeconomic impact of hosting the Olympics and Paralympics will exceed 30 trillion yen in cumulative terms.1 Their estimates include various factors ranging from an increase in construction investment prior to the event and an increase in consumer spending during the event to legacy effects and inter-industry spillover effects through input-output linkages. There are many pieces of evidence concerning the economic impact of hosting the Olympics, which have been drawn from empirical studies on past host cities such as Athens, Beijing, and London. Baade and Matheson (2016) examined the costs and benefits of hosting Olympics based on a comprehensive survey of past host cities. They showed that post-event scrutiny tends to find smaller benefits compared to pre-event estimates, citing the tendency of pre-event studies to ignore the substitution effect in estimating economic impacts as one factor behind this. In other words, Olympics-related spending – such as ticket purchases and transportation – often comes at the cost of cutting spending in other areas, partially offsetting the consumption-boosting effect of the event. Likewise, they noted that the actual number of inbound tourists often falls below the predicted number because of the crowding out effect, in which an increase in event-related inbound tourists discourages non-event-related tourists from visiting the city or region hosting the event. In conjunction with this observation, I conducted a survey of 10,000 consumers across Japan to examine the net impact of hosting the 2020 Tokyo Olympics and Paralympics on consumer spending.3 What follows is an outline of the survey results. 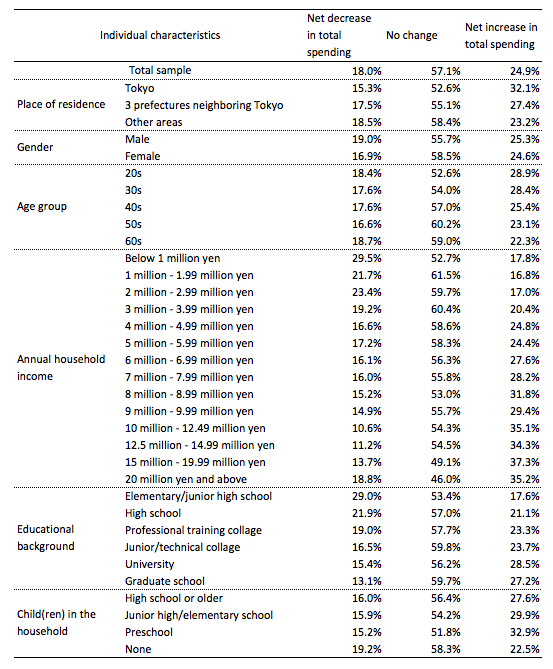 First, in response to the question asking whether they would like to watch the forthcoming Olympics and Paralympics in person by purchasing a ticket, 13.8% of the respondents chose “Yes, definitely” and 31.2% “Yes, if possible.” The proportions are higher among those living in Tokyo at 25.0% and 31.8%, respectively. However, even among those living outside the greater Tokyo area, more than 40% chose either of the two answers. Thus, Tokyo will likely receive a multitude of domestic visitors from rural areas during the Olympics and Paralympics. The majority of the sample expect no significant change in their consumption expenditures, and a non-negligible number of people anticipate a decrease in their consumption expenditures as they expect to spend more time watching the events on TV.4 However, the percentage of those expecting a net increase in consumption expenditures is somewhat higher than that of those anticipating a net decrease, and those with higher income show a greater tendency to expect a net increase in consumption expenditures (which will be discussed later). Given these observations, it is fair to say that consumer spending in Japan will likely increase in net terms during the Olympics and Paralympics. At the same time, the survey results also suggest that the substitution effect is too large to ignore in estimating the economic impact of hosting the Olympics and Paralympics. Who is expecting a net increase in their consumption expenditures? Let’s take a look at the survey results cross-tabulated by individual characteristics, such as area of residence, age group, and household income (Table 1). Not surprisingly, Tokyo has the highest percentage of those expecting a net increase, followed by three prefectures neighbouring Tokyo. While there is no significant difference between men and women, those in their 20s and 30s are more likely to increase their consumption expenditures than those in other age groups. Interestingly, the higher the household income, the greater the likelihood of increasing consumption expenditures in net terms – the percentage of those expecting a net increase is significantly high among those with an annual household income of 10 million yen or more. 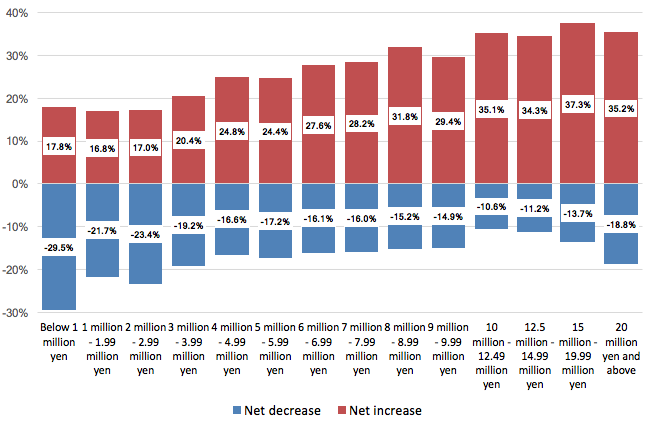 In contrast, among those with an annual household income of less than three million yen, the percentage expecting a net decrease exceeds those expecting a net increase (Figure 1). The percentage of those expecting a net increase is relatively high among those with a college or higher degree, and that of those expecting a net decrease among those with high school or lower education. In addition, those living with their child(ren) – particularly those of preschool-age – show a strong interest in watching the events in person and tend to expect a net increase in their consumption expenditures. Note: N = 10,000. Those expecting no change in their consumption expenditures are excluded. those with higher educational attainment tend to have a higher annual income. In estimating the demand-boosting effect of a large-scale event, including but not limited to the Olympics, we tend to focus on gross increases in demand. In reality, however, a significant portion of event-related consumption comes at the cost of reducing spending in other areas. Thus, we need to make a conservative estimate for the net effect. Putting a positive spin on the above survey results, we may not have to worry too much about a post-Olympics downturn, at least as far as consumption is concerned. However, as aforementioned, we need to pay attention to the heterogeneity of individuals behind the numbers aggregated at the macroeconomic level. The analysis above is based on the results of a pre-event survey in which respondents were asked to provide their subjective expectations. Actual consumption behaviour during the Olympics and Paralympics may turn out to be quite different depending on various factors such as the economic and weather conditions at the time, and the performance of Japanese athletes. It is thus important to conduct a post-event review, using statistical data such as those from the Family Income and Expenditure Survey. Also, it should be noted that the discussion in this column is limited to observations concerning consumption during the Tokyo Olympics and Paralympics, and various other economic effects – such as construction investment prior to the event and legacy effects following the event – are outside the current scope. The levelling of demand is extremely important for the performance of service industries, particularly restaurants and hospitality businesses (Morikawa 2016). How long the positive legacy effects of the Tokyo Olympics and Paralympics will last following the peak demand during the event will have a significant impact on the Japanese economy from 2020 onward. Baade, R A and V A Matheson (2016), “Going for the gold: The economics of the Olympics”, Journal of Economic Perspectives 30(2): 201-218. Mizuho Research Institute (2014), “2020 Tokyo Orinpikku Kaisai no Keizai Koka wa 30-cho-yen Kibo ni: Makuro apurochi to kobetsu koka no tsumiage ni yoru shisan [Economic impact of hosting the Tokyo Olympics expected to top 30 trillion yen: Estimates based on a macroeconomic approach and the sum of the effects of specific major events]”, Mizuho Report (in Japanese). Morikawa, M (2016), Toward a service-oriented country: Opening a new frontier of the mature economy, Nikkei Publishing Inc (in Japanese). Bank of Japan’s Research and Statistics Department (2015), "2020 Tokyo Orimpikku no KeizaiKoka" [Economic effects of the 2020 Tokyo Olympics], BOJ Reports & Research Papers. Tokyo Metropolitan Government’s Bureau of Olympic and Paralympic Games Tokyo 2020 Preparation (2017), Tokyo 2020 Taikai Kaisai ni Tomonau Keizai Hakyu Koka [Economic effects of hosting the Tokyo 2020 games], (in Japanese). Apart from these, the Bank of Japan’s Research and Statistics Department (2015) notes that while the hosting of the 2020 Tokyo Olympics will likely have a positive impact on Japan’s GDP, the magnitude of such impact is subject to significant uncertainty and may be smaller than has been the case in past host countries. These people may engage in intertemporal substitution such as purchasing a new TV set prior to the Olympics and Paralympics. Using a questionnaire I designed, the survey was conducted by Rakuten Research, Inc. over a sample of 10,000 individuals extracted from its registered monitors in a manner representing the distribution of population by prefecture, gender, and age group as observed in the Population Census (Ministry of Internal Affairs and Communications). Among those who responded “Yes, definitely” or “Yes, if possible” to the question asking whether they would like to watch the forthcoming Olympics and Paralympics in person by purchasing a ticket, those who chose 1), 2), and 3) respectively stand at 51.7%, 40.7%, and 7.6%. In other words, the majority of those hoping to watch the events in person expect a net increase in their spending during the Tokyo Olympics and Paralympics. Estimated by an ordered probit model with the place of residence, gender, age group, annual household income, educational background, and child(ren) living together as explanatory variables. [dSN1]NOTE TO EDITOR—I think perhaps this table can be cut, as it isn’t very visually appealing and doesn’t provide crucial information.